No matter what, I always have my pocket knife on me. 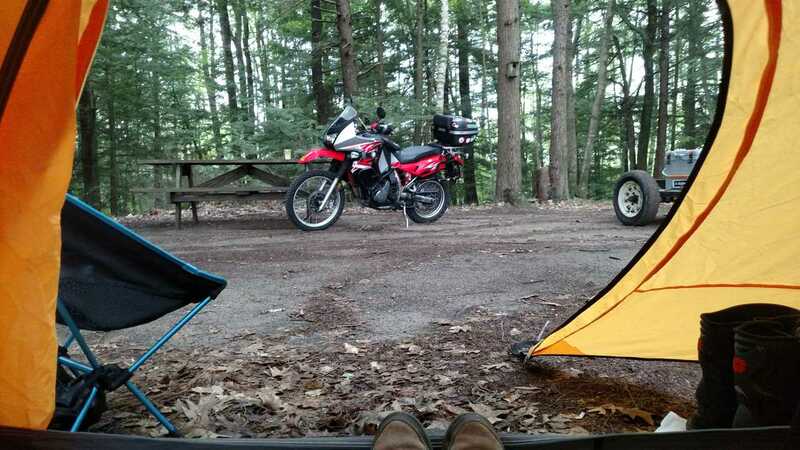 Especially when moto-camping, it is my most used tool. I use it to slice up things like cheese and apples, cut rope, open any newly-purchased items, cut a branch off a tree to cook meat and then marshmallows over the fire. I never worry about being able to tackle a steak or cut up a kielbasa to roast. In a pinch, with the blade closed, you can use it as a bottle opener. 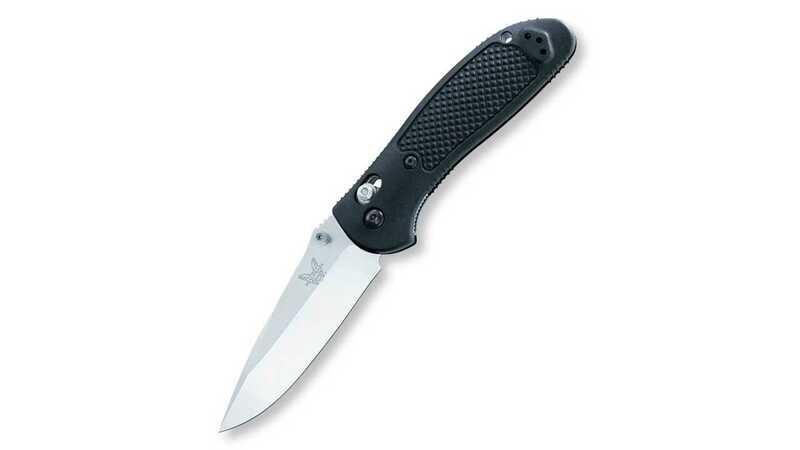 I carry a Benchmade Griptilian, but like most of the things in this list, the choice of a pocket knife is extremely personal, and you can spend as much or as little as you want on it. Choose wisely because a good tool is a joy to use, and a crappy tool will make you mad. With the simple, extremely packable combination of a pocket knife and a titanium spork on you at all times, there is no meal you will encounter in the wild that you cannot tackle. This particular spork has a bottle opener on the other end, which comes in handier than I'd like to admit. 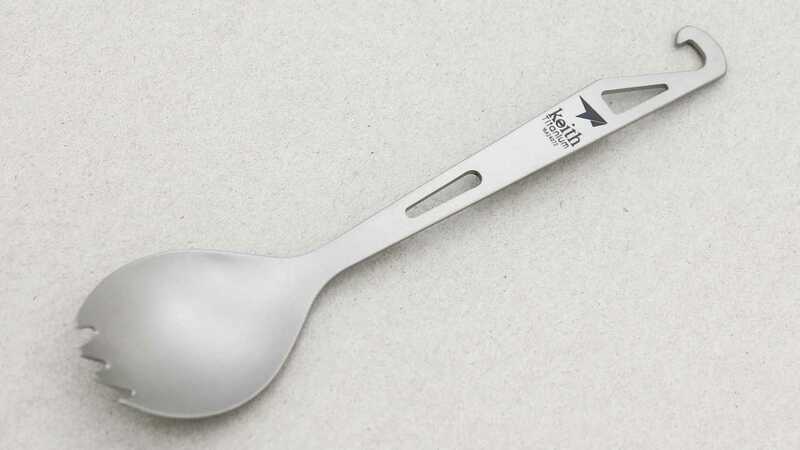 There are so many brands of titanium spork at this point, I'm not going to steer you toward one, but will say that the combo tools (spoon on one end, fork on the other) can get messy. This one has a handle long enough to stir a cup of coffee, if sugar in coffee is your jam. We're going from most to least essential with this list, and you can tell from the order how much I love my spork. We all need something to sleep in, though. 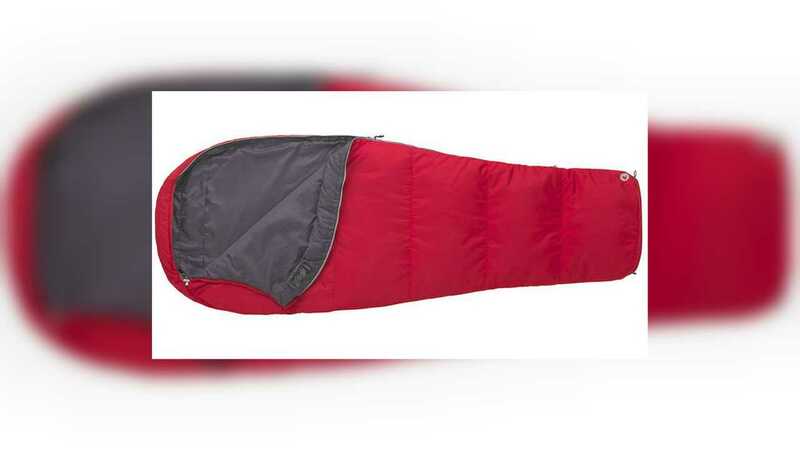 The choice of a sleeping bag is another deeply personal choice, so consider your options. Note that men and women are differently exothermic, so a sleeping bag that is comfortable for your partner might not be comfortable for you. I like to think of the temperature rating on the bag as the temperature above which you will not die. You won't necessarily be comfy if you are a chilly sleeper. If you are a furnace when you sleep, you're freer to choose a lighter bag. Also if you never plan to cold-camp, take that into your decision. Are you a sprawler when you sleep? You might wake up feeling extremely confined in a mummy bag. You might feel just fine with your camping pad, and many people do. A cot is another option to put something between you and the rocky ground. If you're comfortable sleeping directly on the dirt, scroll on, light packer! What I love about the cap cot is: it does not matter how rocky the ground is because you do not notice it; and you have under-the-bed storage. 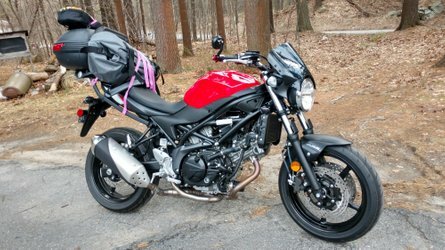 I stuff my riding jacket and pants under my cot, along with all my packing flotsam: drybags, tent bag, sleeping bag stuff sack, etc. All hidden away under the bed. 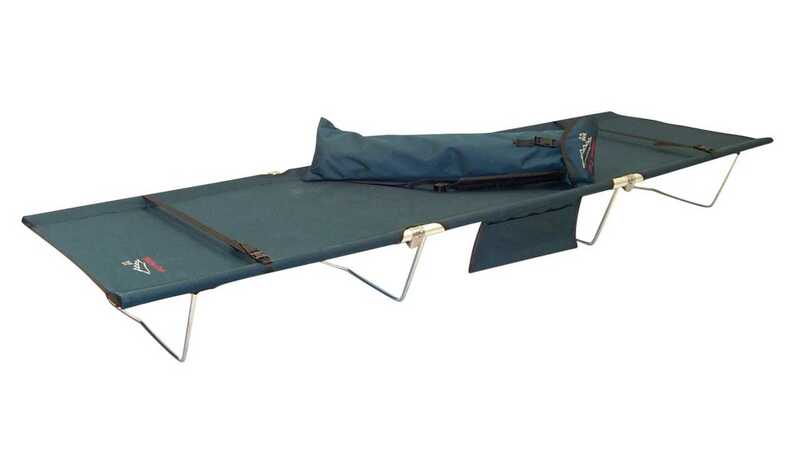 There are a ton of camping cots on the market; choose one that has the features important to you. Do you need it on the wide side (better for a side sleeper)? Does it need to hold a lot of weight? Do you need it to pack up very small? Mine is a Tri-Lite cot from Byer of Maine. It's rugged, comfortable and made in the USA. I have slept on it for a lot of weeks over a lot of years and it's been great. Some people need to combine a cot with a sleeping pad, either for warmth or for comfort. I say, you do you! 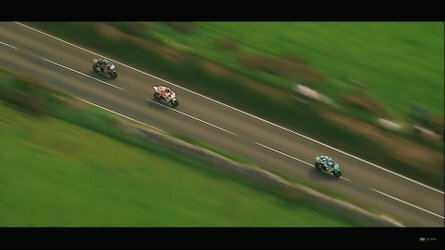 Be mindful of how much extra weight you're piling onto your motorcycle though. I camped for a lot of years using whatever was at hand (my riding jacket, mostly) for a camping pillow. 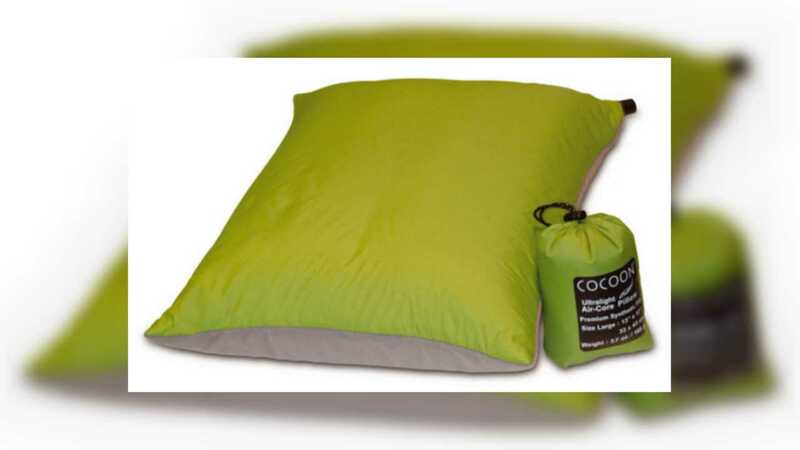 This has changed with the recent advent of decent camp pillows that fold down to smaller than the size of a soda can, and my aging neck no longer finding those shenanigans amusing. This is, again, a very personal decision, but I have some hints. Do not blow up your inflatable pillow until it is as hard as a rock. You want your pillow to be kind of soft. If you're a side sleeper you'll need a larger pillow than a back sleeper. 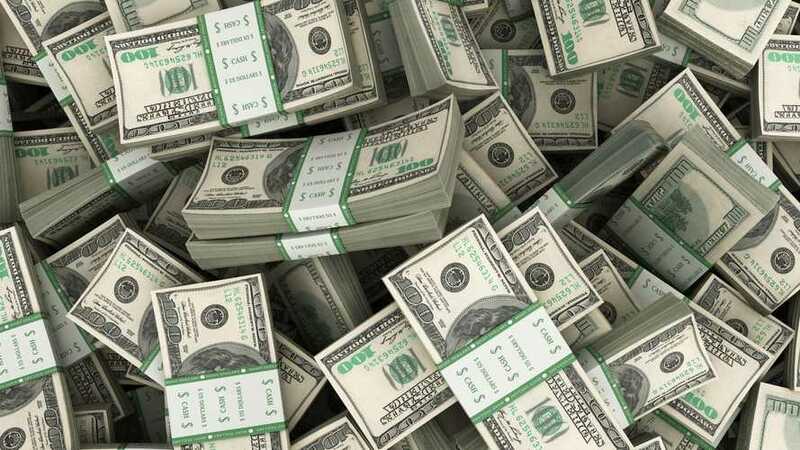 This is another purchase you can spend as much or as little as you want on, depending on how important it is to you. 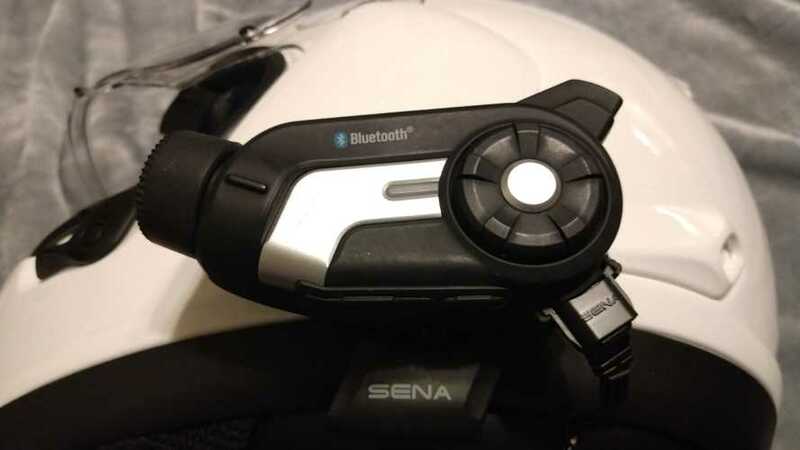 Sleep is important, and trying to pilot a bike when your neck is thrown out is not a treat, so especially if you are getting on in age like many of us are, get serious about a decent pillow. When you're in a proper campground and have a site to yourself, you'll probably have a picnic table at your disposal. 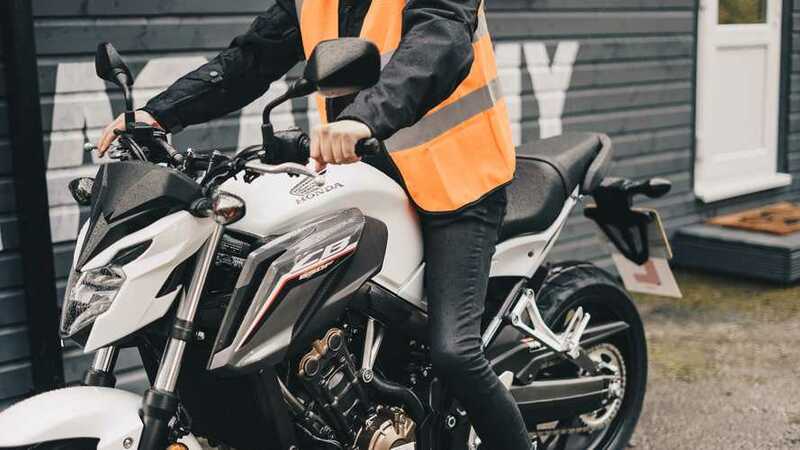 If you're rallying, though, or wild camping, you might want something other than your bike to sit on at the end of the day. This style of chair folds up and packs small enough to fit easily into any motorcycle saddle bag. Helinox apparently did not patent their chair thoroughly enough, though, because just after their incredible success came a raft of strikingly similar competitors. The knockoffs are sometimes good, and sometimes very rickety. This chair is an alternative to the previous one. If you have ever been to a BMW MOA rally, you will have seen this chair absolutely everywhere. 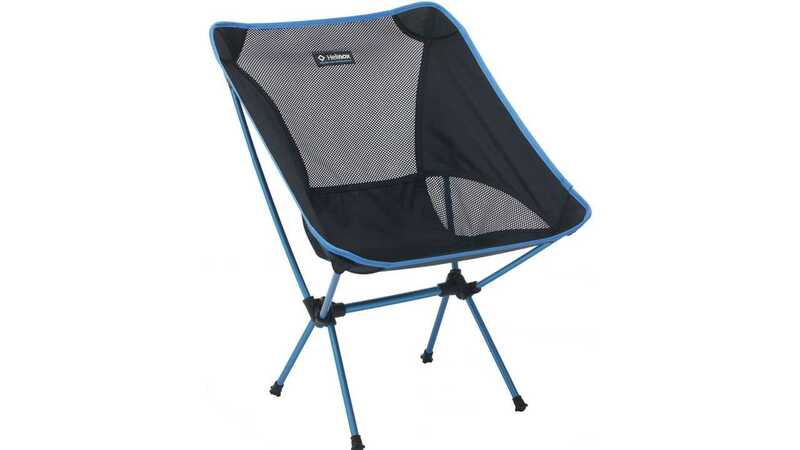 The Kermit camping chair is the unofficial camp chair of the MOA. The chair has some drawbacks. It assembles something like one of those cast-iron bar puzzles, so dedicate some time to putting it together before you start drinking. It is heavy. It packs down sort of small, but not small enough to fit into your hard luggage. It is rather expensive. That all said, it is solid, and rugged, and your overweight friends will not break it. 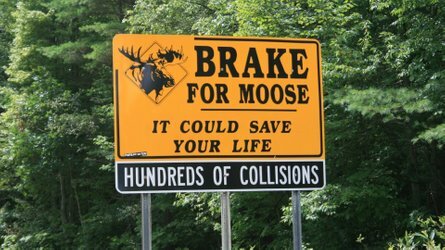 It comes in several colors. It is made in the USA. It will last you for the rest of your life. The arm rests are strong and will help you get up out of the chair, and you can purchase leg extensions that bring it up from beach chair to normal chair height. 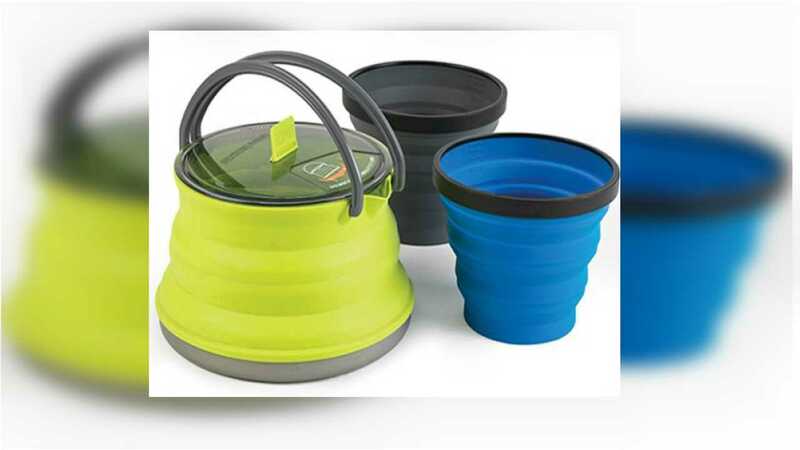 When you need to make coffee in the morning, a collapsible kettle makes things easy. Sure, you can wash some instant coffee grounds down with some cold water, but wouldn't you rather live a civilized existence? 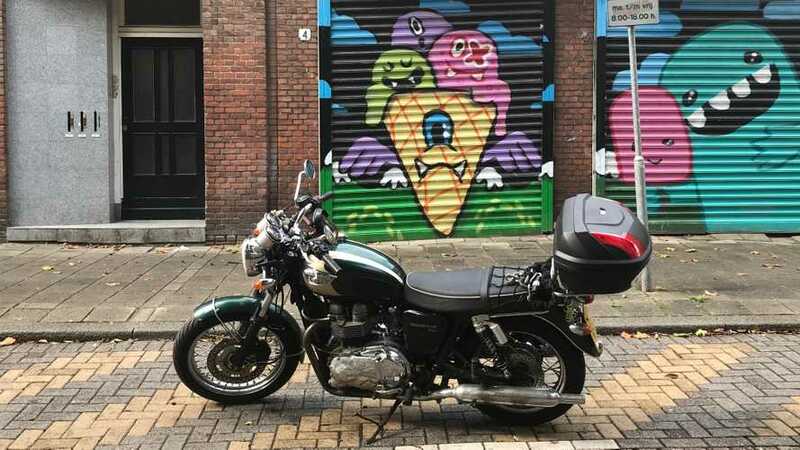 Use your neighbor's campfire, and haul out that pour-over you stashed in your saddlebag. This is another product that seems to be everywhere, made by everyone. Choose the form factor that works best for you. 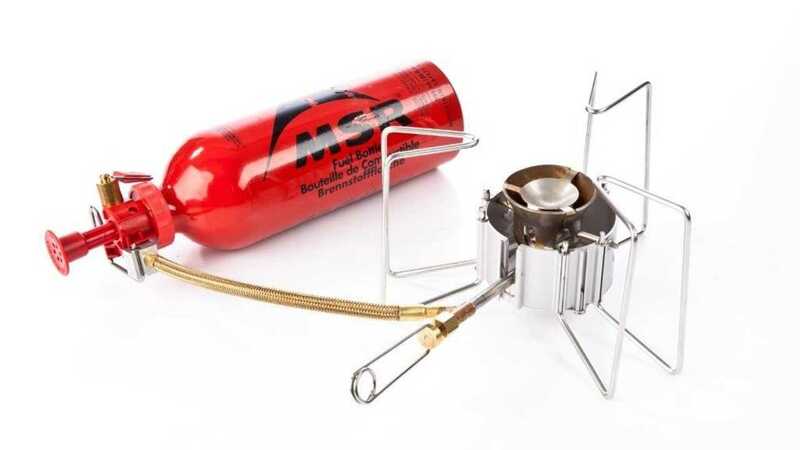 If your camping neighbor does not have a roaring fire by 6AM, or you're wild camping and starting to get the shakes, this MSR Dragonfly camp stove will get a quart of water boiling in less than a snap. It runs on white camp gas, and the whole setup is not cheap, but this is a huge "buy quality, cry once" moment. A cheap camp stove can be ineffective and dangerous. Follow all instructions on every camp stove very carefully so that you do not incur tragedy. Never, never run your camp stove inside your tent, no matter how cold it is. You run a very real risk of burning to death with no easy exit. 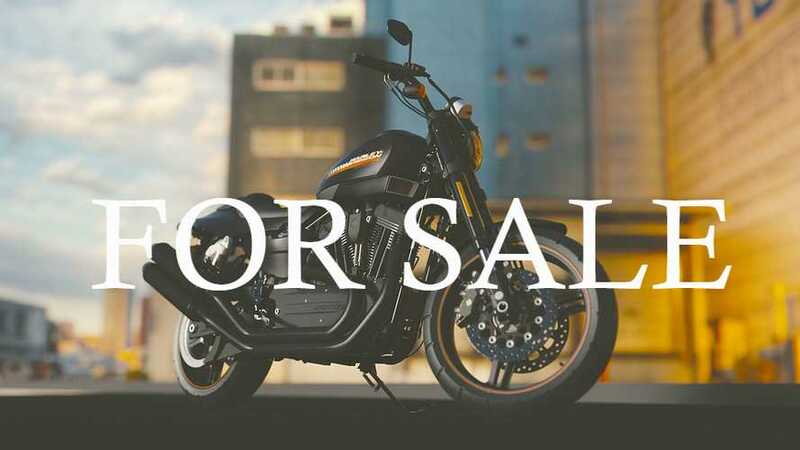 This item falls squarely into the "nice to have but not necessary" category, especially if you are drinking out of bottles at night, and up early to grab a coffee at a convenience store or nearby motorcycle dealer in the morning. 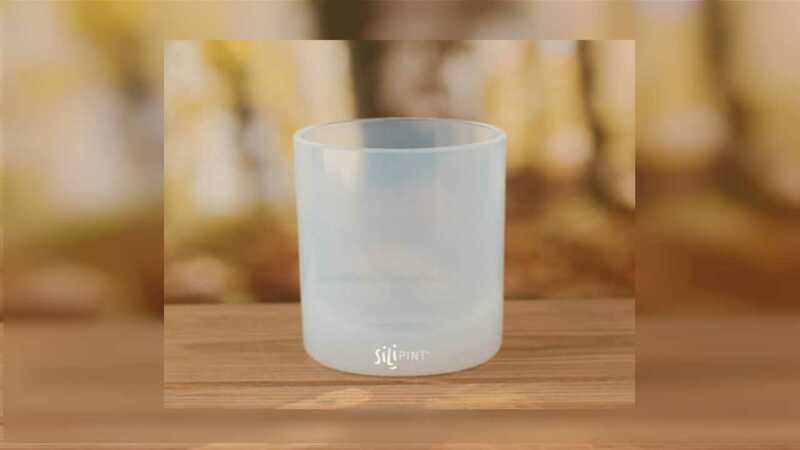 If you are, however, more inclined to drink something out of one shared bottle at night, or want to keep your drink on the DL, and you'll also be making yourself some coffee in the morning, a Silipint tumbler or pint glass will accommodate both of those things and make you look smart doing it. I'm not a paid shill here, I've bought a lot of their products and love to camp with them. Hot tip: find one that glows in the dark and you will not lose or misidentify your drink at the fire. 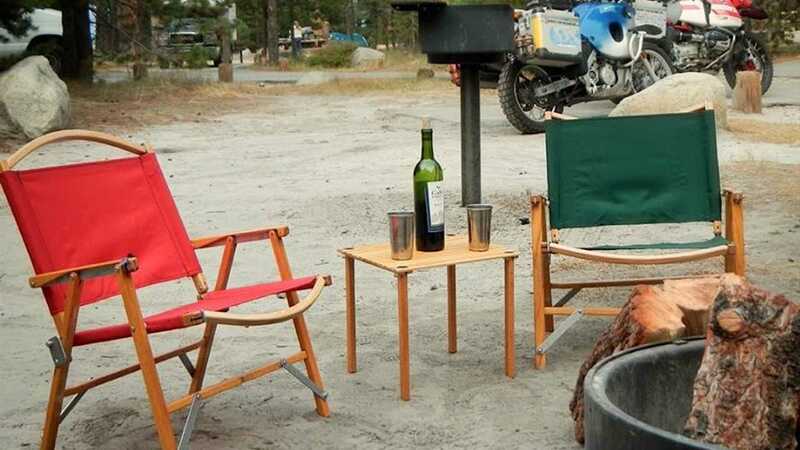 Motorcycle camping can be as simple or as luxurious as you choose to make it. Here is a list of ten things I've found super useful while camping to make things comfortable and the camping experience smooth. 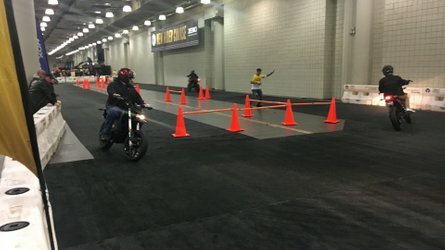 For the purpose of this article I'm going to assume you already have the important things like a tent and a motorcycle. Read through and let me know if I missed anything, or if you've found some better options.